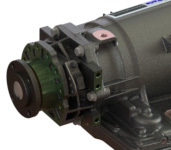 Electronic transmissions can provide significant advantages over older hydraulic and hydrostatic transmissions, but their integration into the vehicle can initially appear complex and time consuming. 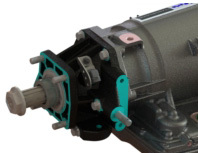 After years of assisting vehicle manufacturers with designing and installing transmissions into drivelines, PCS has developed complete transmission packages that include everything needed for a well-engineered driveline solution. This simple solution allows the vehicle manufacturer to draw from PCS' expertise and focus on other vehicle aspects and manufacturing. A complete transmission solution includes much more than just a transmission and torque converter. All PCS packages include vent kit, dipstick, TCU, harness, flexplate, and more. 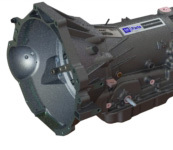 At the core of every transmission package is a GM/PCS 4-speed transmission. Vehicle manufacturers select the bellhousing, valve body, and parking brake options that meet their needs. PCS transmission packages are available with bellhousings for common engine flywheel housings including SAE3, SAE4 and more. The optional disc parking brake mounts directly to the transmission. The caliper can be mounted in several positions providing clearance for transmission tunnels or exhaust. The cable can be configured for left hand or right hand connection to the brake caliper. Engine adapters are available for Deutz, Kubota, Perkins, Ford, Cummins. 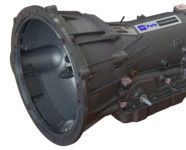 PCS offers a warranty for transmission packages used in validated installations. For more information regarding warranty and installation validation, please contact PCS. PCS offers two models of the GM 4-speed, the 4LHD and 4LHDX. 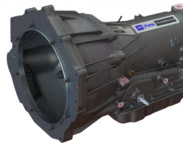 Both models are enhanced versions of the GM 4L60/70 transmissions that have been in production since 1993. Often times the operator causes the most damage to the transmission, reducing the service life and causing costly repairs and downtime. 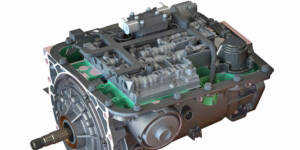 The PCS 4-speed abuse protection valve body protects the transmission by locking out reverse engagement until the vehicle is stopped and the engine is at idle. It also prevents "neutral drops" by only engaging the forward gears when the engine is at idle. Eliminate the shift cable and shift the transmission electronically with a push of a button or movement of a lever. Driver inputs can be validated based on vehicle modes and conditions so the vehicle is operated within standard operating protocols. Also eliminate transmission failures due to the shift cable not adjusted properly. The PCS inching valve body allows the operator to move the vehicle forward or backward in small increments from an operator's panel remotely mounted on the vehicle. This greatly reduces time when connecting to trailers or other equipment and makes the operation more efficient for one person. All transmission feature the patented PCS Abuse Protection System (APS) valve body which solves many common industry issues. The configuration of the engine mounting face varies according to engine usage. The 4LHD/4LHDX currently supports five types of mounting faces. TO COMPARE PCS 4-SPEED BELLHOUSING OPTIONS, PLEASE CLICK HERE. All four standard extension housings available through PCS have integrated vehicle mounts. Any proposed boss locations and threaded fastener designs must have PCS Engineering approval for load analysis. Mount loads should be supplied by the customer. For an updated list of vehicle mount options reference the PCS OEM Parts Catalog. The factory torque rating for the six transmission to extension housing bolts is 37 ft*lbs / 45 N*m. In addition, the speed sensor bolt in 2WD applications has a torque rating of 8 lb*ft / 11 N*m.
TO COMPARE PCS 4-SPEED OUTPUT OPTIONS, PLEASE CLICK HERE. For 2019, the GM/PCS 4-Speed transmission will be readily available for new vehicle designs and upgrade packages. For quotes and purchase orders, please contact pcs for assistance updating prior part numbers. 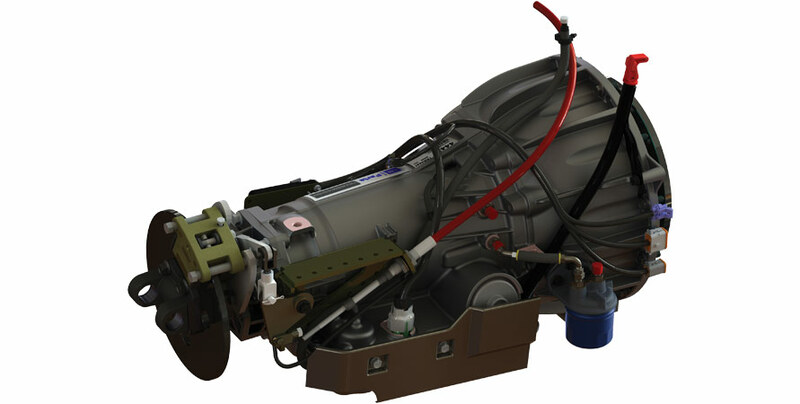 The following transmission components may be available under special order or remanufacturerd units, however they should not be implemented into new vehicle designs or upgrade packages. NOTE: Contact PCS for remanufacturing program options and more information on our core charges.